Weak charts Vs Positive data. On Thursday, 2 of the major US stock indexes finished below their support marks keeping their near-term trends Bearish, while another closed above its near-term downtrend line, turning its trend to Neutral. But the economic the data is sending encouraging signals, especially regarding market psychology. The indexes finished mixed Thursday with negative internals on the NYSE and NAS Comp on lighter volume. 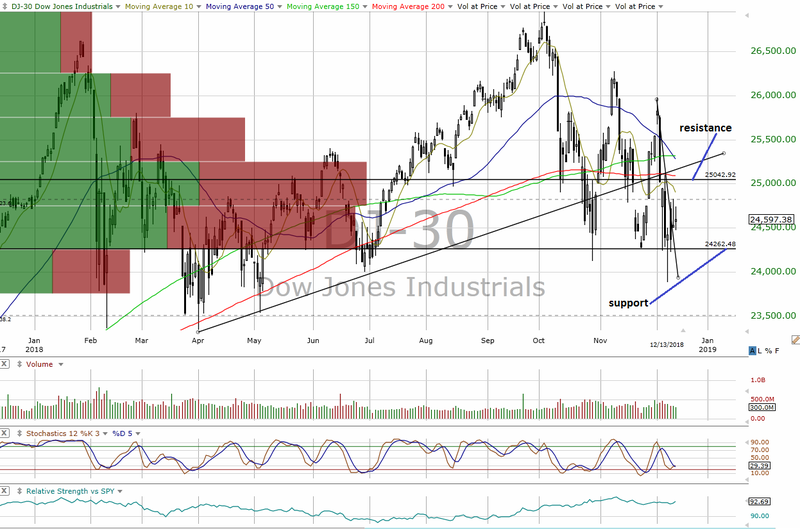 Negative signals came from the Dow Transports and S&P MidCap 400, which broke below their support marks. But, the DJIA closed above its short-term downtrend line, shifting its trend from Bearish to Neutral. So, the near-term trends are evenly split between Neutral and Bearish trends. The cumulative advance/decline lines for the All Exchange, NYSE and NASDAQ remain in downtrends and below their 50-Day MAs. Now, looking for more violations of downtrends and resistance as well as better breadth in order to become more positive. The data finds all of the McClellan Overbought/Oversold Oscillators Neutral (All Exchange: -27.87/-43.24 NYSE:-27.94/-41.45 NASDAQ:-29.98/-41.45). However, the market psychology data is very positive, as the detrended Rydex Ratio (contrary indicator; see below) finds the “crowd” very leveraged Short at -1.05. That same “crowd” was heavily leveraged Long in October, prior to the start of the pullback. The Detrended Rydex Ratio Is -1.05 (Bullish). In contrast to the “crowd” the insiders are buying their stock in amounts levels seen only 5 other times in the past 10 years with a 152.0 Open Insider Buy/Sell Ratio. Notably, in each of the prior events, they happened at of near market bottoms. Valuation still seems very appealing as it is well below fair value, assuming current estimates hold. The S&P 500 is trading at a forward P/E multiple of 15.6x 12-month earnings estimates via Bloomberg of 170.30/share, Vs the “Rule of 20” implied fair value multiple of 17.1x. The “earnings yield” stands at 6.42%. Seasonality remains encouraging as the November to April frame coming out of a mid-term election year has seen positive returns since Y 1946 with a median return of 15% since Y 1930. Only 2 out of 21 frames were negative. Despite the Bullish psychology data, we are cautious about becoming more Bullish until some improvements are seen on the charts and general market breadth, thus leaving our near-term outlook at “Neutral” in here.